The Robot Power MegaMoto PlusTM is a low-cost robust H-bridge "shield" for the ArduinoTM and hardware compatible base units. 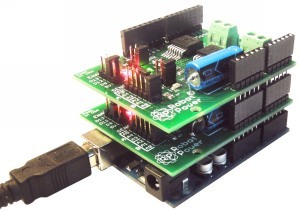 The standardized shield format stacking headers allows multiple MegaMoto Plus units to be controlled by a single Arduino Uno or Duemilanove using pass-through stacking headers. 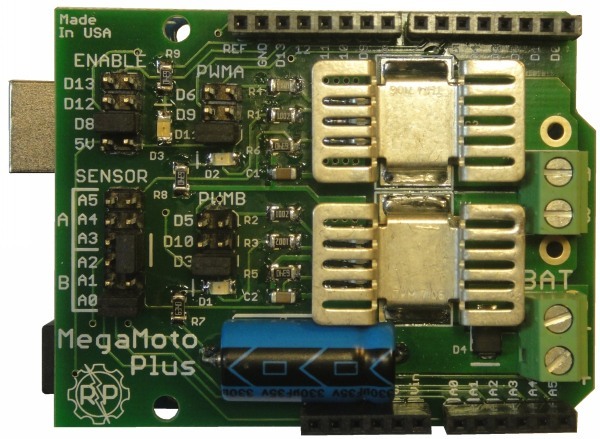 The MegaMoto Plus is a dual half-bridge circuit that can be configured either has a full H-bridge or as two independent half-bridge circuits. This allows a single MegaMoto Plus to drive one motor with full variable-speed control both forward and reverse. It also allows two independent motors	to be controlled in a uni-directional fashion by connecting one side of each motor to the battery negative and the other motor lead to one of the MegaMoto Plus outputs. Robot Power offers the MegaMoto Plus fully assembled and tested. Check the Web store for details on prices and special offers.